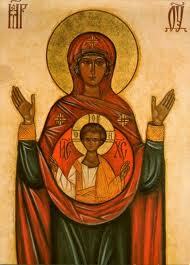 Mary, the Mother of God, shapes the Christian identity of the believer and the vocation of every human person. For every human person without exception has been created to know and love Jesus Christ, and in Christ to share forever in God’s very own life of Ineffable Love. Mary, indeed, is at the center of what it means to be a Christian, which means that she is also the center of the whole human race. In accordance with the mystery of God’s magnificent, gratuitous plan of love, she brought forth into the world and continues to bring into our lives the One who concretely constitutes the true meaning of our humanity. By cooperating with her whole being, her whole affections, her whole heart and her whole will, Mary brought into the world the only One who can give meaning to the universe. For from the beginning, the universe has been destined to be transformed by God's gift of Himself. God created the universe and everywhere permeated it with a mysterious impetus corresponding to the design of His Love. And in the beginning, the human being was created to be a tupos, a sign, of the-One-who-was-to-come, the One who will bring all things into unity and fulfillment in Himself.